Reducing the price of slow-selling product lines can be an effective way to drive sales and reclaim valuable selling space – but how do retailers ensure that these markdowns are profitable? 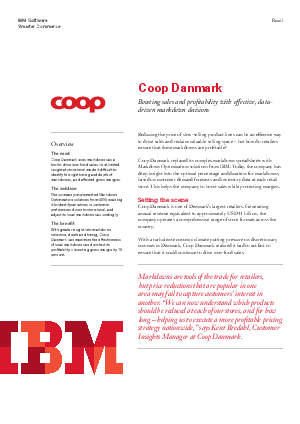 Read this case study to learn how Coop Danmark replaced its complex markdown spreadsheets with Markdown Optimization solutions from IBM. Today, the company has deep insight into the optimal percentage and duration for markdowns, based on customer demand forecasts and inventory data at each retail store. This helps the company to boost sales while protecting margins.